Ahhh Kauai, “The Garden Island", a true island paradise! where the stress of life fades away into the gentle trade winds. Dramatic cliffs and the panoramic Na Pali Coastline have served as backdrop for major motion pictures, including Jurassic Park. When flying into Lihue, for the best view, choose a window seat on the left side of the airplane. More often than not, flights arrive at the northern side due to the trade winds. Kauai Activities ~ Largest selection ~ Low price Guarantee! Kauai is the oldest island in the Hawaiian chain. Over 90% of the land on Kauai is used for Conservation and Agriculture. Kauai is covered with shades of green and tropical flora, watered constantly by abundant rainfall. There are over 80 different species of birds which nest on the island and 21 of them are exclusively native to Kauai. Much of what you can see here is untouched & breathtaking. What to do.. Kauai is where you want to take that helicopter tour, roads only cover about 10% of the island. 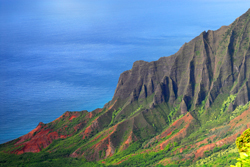 The Napali Coast and its 17-mile coastline took millions of years to form. These breathtaking cliffs that stretch thousands of feet in the air can only be seen from the sea, by air or by hiking the Kalalau Trail. Kauai has eight state parks awaiting your adventurous side, not to mention a plethora of trails that crisscross the island. Those with a thirst for adventure, you won’t be disappointed if you find yourself soaring over treetops on a ziplining tour or foraging deep into a tropical jungle while on horseback. How about a unforgettable Kayak adventure down the Wailua River to the majestic 125 foot “Secret Falls”. Locals know...You can go Mountain Tubing through former Lihue Plantation lands, explore deep into Kauai’s pristine emerald green interior. Float through amazing hand made tunnels that were carved over 100 years ago leading to waters from the rain forest to the sugar cane plantations that once thrived many years ago. Ke'e Beach, a breathtaking spot and is remarkable at sunset. During the summer months the water can be as calm and clear as a swimming pool. The white sands of Ke’e Beach are protected by a reef that makes it a safe place for snorkeling and swimming. Ke’e is among the most picturesque and romantic beaches in Hawaii, set beneath the peak of Makana, often called Bali Hai from its role in the 1958 movie South Pacific. Kauai is also home to three of the world's National Tropical Botanical Gardens. Wildly different and breathtakingly beautiful, each garden offers tours for every age and interest. Limahuli Garden was selected by the American Horticultural Society as the best natural botanical garden in the United States. McBryde Garden is incredible and is home to the largest ex situ collection of native Hawaiian flora in existence. Allerton Garden is a landscape architecture masterpiece named one of the ’50 Places of a Lifetime’ by National Geographic Traveler. Kauai is home to some of the world's best golf. There are 10 golf courses at seven venues on Kauai. Princeville on the North Shore offers two challenging options with an 18-hole and a 27-hole course. Designed by some of the most prominent golf course architects of the last 50 years – Jack Nicklaus, Robin Nelson, Robert Trent Jones Jr.
Shopping…… For “Kauai Made” products, seek out the Kauai Made logo, sponsored by the County. The seal designates products made on-island by Kauai-based businesses or by individuals using Kauai materials.